Just as sure as a hurricane brings TV news footage of a reporter standing on a boardwalk with waves crashing in the background, stormy times in the market also bring out journalistic cliches. Breathless and overhyped commentary and pictures abound – in print, on the air and online. The problem is – I know this will sound nerdy – the lack of a proper scale on the Y axis. When a graphic designer sets the base of the scale not at zero but at some higher point, it creates a visual exaggeration. In this case, a Dow Jones Industrial Average index of 10,900 is the base. The truncated scale makes a more dramatic picture, but the reader gets a quantitative impression that is out of context. 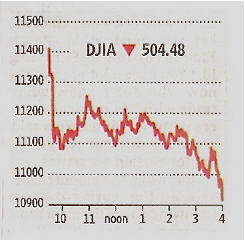 Instead of a 4.4% drop, our eyes see the stock market plunging more than 95% – very close to “zero” on the graph. Of course, an editor might say readers are smarter than that; anyone sophisticated enough to read the WSJ can tell the difference between zero and 10,900. Yes, but images do influence our thinking – and more on an emotional level than a rational one. Moving beyond whining about a pet peeve, I might suggest a lesson for investor relations professionals: We should always look at our graphs – those bar charts that fill PowerPoint presentations and some say are eye candy in annual reports – and test them for visual integrity. The classic bar chart might show EPS rising from $3.00 to $3.25 to $3.50 over three years. If the Y-axis scale starts at zero, the eye sees a 17% total rise – looks steady, not too bad. But if you draw the scale starting at, say, $2.00, the increase in EPS looks like a more dramatic 50% – much more “growthy.” Try it both ways in Excel or PowerPoint; you’ll see. My Excel sets “zero” by default at $2.70 – which really makes for skyrocketing growth. Financial communicators of all sorts, corporate or journalistic, should be careful to present information not only accurately, but in context and with perspective … which I think means graphs drawn to scale.